Pitchers and catchers report in one month, and we are still waiting on the two biggest names in this year's free agency to sign. While this offseason drags on -- and we hopefully get closer to a Bryce Harper and/or Manny Machado signing -- we'll keep you updated on all the latest rumors and transactions. Here's everything you need to know from the second Sunday of January. 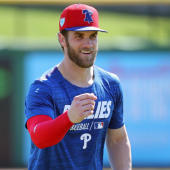 After a face-to-face meeting in Las Vegas with Bryce Harper, his agent Scott Boras and his wife Kayla on Saturday, the Philadelphia Phillies have emerged as "the clear-cut favorite" to sign Harper, according to Bob Nightengale of USA Today. Nightengale reported that executives of the Nationals, who are hoping to bring Harper back to D.C. this winter, now consider that reunion a "long shot." The Phillies contingent for Saturday's meeting included owner John Middleton, general manager Matt Klentak and manager Gabe Kapler. The meeting reportedly lasted for five hours before the group flew back to Philadelphia. Jeff Skversky of 6 ABC Philly spoke to both Middleton and Klentak after they landed back in the City of Brotherly Love. Middleton told Skversky that the meeting was "really positive," and that they "got to understand what [Bryce] would be like for the clubhouse and community." With Middleton having confirmed what baseball fans had long speculated -- his team was ready to spend "and maybe even be a little bit stupid about it" -- the Phillies may be the best landing spot for Harper if he wants a record-setting contract. The Chicago White Sox have made an eight-year contract offer to free agent infielder Manny Machado, sources tell ESPN's Jeff Passan. Go here to read more about the offer and Machado's fit on the south side of Chicago. The Yankees' talks with Machado are either dormant or completely dead, and unless Machado accepts far less money from the Yankees than he might get elsewhere, Andujar will be back at third base. As Olney also writes, Andujar, who hit 27 home runs last season as a rookie, has been working hard to upgrade his fielding at third base. The Yankees in turn sound committed to him. That lack of desperation on the Yankees' part means they can set a price for Machado and, as Olney reports, engage him only if the market falls to that level. The Washington Nationals officially announced the signing of free-agent second baseman Brian Dozier on Sunday. The Nats agreed to terms on a one-year, $9 million contract with Dozier and in a corresponding roster move, designated infielder Matt Reynolds for assignment. Brian Dozier has passed his physical and is officially a member of the Washington Nationals. His deal is for one year and $9 million with no options. We've agreed to terms with 2B Brian Dozier! With Dozier as their second baseman, the Nationals addressed their biggest remaining roster question outside of Bryce Harper. Dozier, 31, split last season between the Twins and Dodgers, hitting .215/.305/.391 (88 OPS+) with 21 home runs in 632 plate appearances. He hit 34 home runs in 2017 and 42 home runs in 2016. Dozier did not rank among our top 50 free agents. He joins Yan Gomes, Kurt Suzuki, Patrick Corbin, Anibal Sanchez, and Trevor Rosenthal as notable Nationals' offseason additions. Reynolds, 28, spent little time in the big leagues last season (14 plate appearances) and holds a .635 OPS in 240 career major-league plate appearances, but he played every position beside pitcher and catcher in the minors. At the Triple-A level, Reynolds hit a solid .265/.355/.424 in 355 plate appearances.